Ubiquia’s bread and butter, and the application you’ve learned to love, SqBx Package Tracking, supports anything from universities to hospitals to professional sports teams. 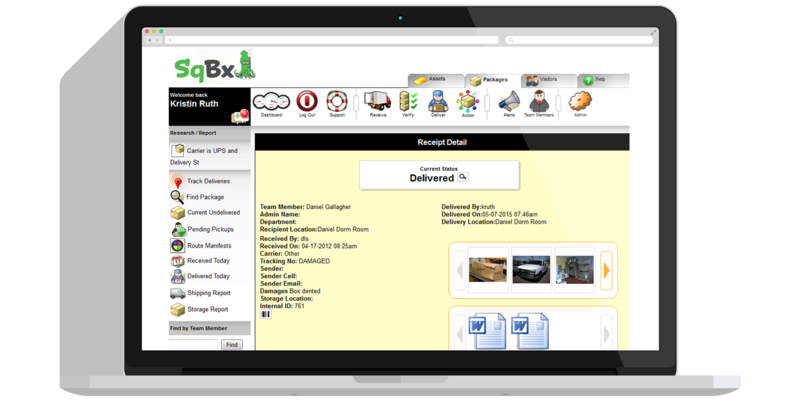 More than just chain of custody, SqBx Package Tracking allows you to be everywhere in your business at once. SqBx assigns communication rules and events to happen behind the scenes, giving you visibility and control from anywhere. Our SaaS can help you improve workflows, identify bottlenecks and maintain a chain of custody of packages, processes, vehicles, and much more. SqBx keeps your operations secure with cloud-based storage. Our software can route the package based on the recipient’s location. Package Tracking can be set up to send out an automatic email and/or text notifications that you can customize to let the recipient know their package has arrived. Rely on SecureWeave signature capture to embed signatures for ultimate security. Personalize your configuration to the way you do business. Collect a signature and rest assured; each and every movement within the system is documented and saved for seven years within the safety of our servers. Get rid of hand-written logs, delivery tickets, and redundant filing processes. Staff members can receive purchase orders and reconcile items. SqBx seamlessly exchanges data with ERP/MMIS systems making it an easy and efficient process without having to switch over to other programs.